Great apartment in a perfect location for access to beach and restaurants. Apartment is fully equipped and very clean. Easy and pleasant experience to rent this apartment. Being from Kentucky we don't get to the West Coast that often but when we do, PCV will be our first look. We worked with Ashley. She was so friendly and helpful. We experienced a late change in properties due to cancellation by the owners. Ashley helped us get into another property that ended up being a perfect place. the Townhouse was a delight. It was well furnished, stylish, picture perfect views of Mission Bay. It was close to all the activities we had planned and easy to access. The neighbor was friendly and helpful. We loved it! Enjoyed all our interactions with Ashley! She was so prompt, professional, and informed. We really enjoyed our time at Pacific Paradise. This was our second year staying here and it did not disappoint. Three generations together for our OB vacation for a week and we loved every minute. Once I got in touch with Ashley she was very helpful. 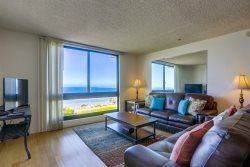 The property in Solana Beach was one of the best properties we have stayed at through VRBO and Airbnb. The property was actually better than pictured and completely met our needs. Another great experience at this property . Will use Pacific Coast Vacation properties again. Classy on Cass was a great property. Very open space with big rooms and a well equipped kitchen. WiFi was just fast enough to stream HD movies from the smart TV�s. Couches were comfy as was the bed. AC units keep the place down to about 77 degrees indicated in the hottest summer days. The shower is wonderful with great water pressure and the bathroom is spacious. The rear deck is equipped with a grill and some nice furniture with nice lighting. The downstairs surf shop staff is super friendly and very courteous as well. It�s located in a real nice area with great access to everything. We loved it and also loved how helpful the staff was at PCVP, especially �Ashley� with her responsiveness to any issues that may arise during your stay. Rest assured they will take care of you. From start to finish, my experience with renting our vacation property with your company was fantastic. They were Knowledgeable, professional, friendly and helpful. The property had everything we could ask for. The location was ideal. We will definitely be back again! Overall, it was a beautiful home with lovely ammenities. My only comment would be that once told we were able to check in earlier, we were not able to let ourselves in using the given code until 3:00. We waited, a while, but not a big deal. Additionally, the downstairs bathroom has mold around the base of the outside of the shower, I am sure you must already be aware of that. Your team is outstanding. Very kind and professional. The ease and convenience of the property was excellent. The house provided us with boogie boards, surf boards, beach chairs, beach towels, and bikes to ride. We had a blast riding up and down the board walk, watching the waves and people watching. Ashley was more than helpful in every way. We spent another family Christmas week at this beautiful home. We also celebrated Grandpa Johnny's 100th Birthday. It was fabulous for all ages! Thanks so much! Ashely was very helpful and professional. She even called me while I was in San Diego to see if everything was good. Nice 2 bedroom condo is a great location. Close to the ocean and the pier. Walking distance to shops, dining and nightlife. I had trouble getting the hot tub to work. I called Greg and he helped me get it going in no time. We had a great time on our first trip to San Diego. The house is very spacious and there was plenty of room for everyone in our family. The kids loved the pool and the adults loved the hot tub. Great place to stay. We had a great time in San Diego, and we loved the house in El Cajon. What a nice place and what a nice neighborhood. And so close to San Diego. We have been travelling a lot the last 10 years, but this is really in our Top 3 of best destinations ever. It�s a pity that it�s such a long flight to get here, otherwise you would see more of us. Pacific Paradise is a fantastic property. Could not have asked for a better equipped kitchen. The laundry facility was a must with teenagers and a toddler. As the kids went off to explore the beach and other activities in San Diego we grandparents just enjoyed the view from the balcony. Such a wonderful place to people watch and enjoy the waves. Thanks Frank for sharing your home. Very easy and friendly. Good response time. This unit is in a fabulous location with great amenities. Very well taken care of property. Unit 612 is amazing! The views are remarkable any time of day! We slept with the sliding doors and windows open so we could feel the cool breeze and hear the sound of the waves crashing. The location was great, as well! We were walking distance to many restaurants, bars and shopping. We were a group of 6 ladies on our annual girls trip. We were all very comfortable. We planned whale watching and a walking food tour which we had to drive to, but it wasn't that far. I would stay in this unit again, for sure! Greg was a text away and answered any questions that came to mind. If your looking for a great location....this is it! This house was exactly what we need it for our 4 day get away. It has a good layout and very spacious throughout. The house is nicer than what the pictures show. Very good neighborhood. No problems with the neighbors and we even had a local tamale vendor deliver freshly made tamales in the mornings! A few of us were here for a guys getaway, take in a Dodger/Padres Game, golf and Gaslamp. The house is close to everything and just an Uber away. Very nice home to relax, BBQ and have a few cold ones! Thanks for having us, we will definitely recommend this house. Greg was very welcoming and pleasant. The insights he shared about the local area and places to visit in San Diego were spot on. Nothing was too much trouble. The house was excellent, true to the pictures on the web site. A great location for all the major attractions but far enough out of the city to relax. Greg Ross was great to work with. We stayed in unit 612 Capri by the Sea and it had a spectacular view in the best location. The condo itself was very nice and clean with all the items I needed to cook with and had beach items to use. We had and issue with one on the toilets but it was resolved fairly quickly. FYI there is a outside shower in the parking lot next to North elevator for washing off sand from the beach. The beds and linens were fantastic!! So comfortable!! Very quiet unit and building and the pool area was amazing, very close to all the bars and restaurants. Definitely will be back.